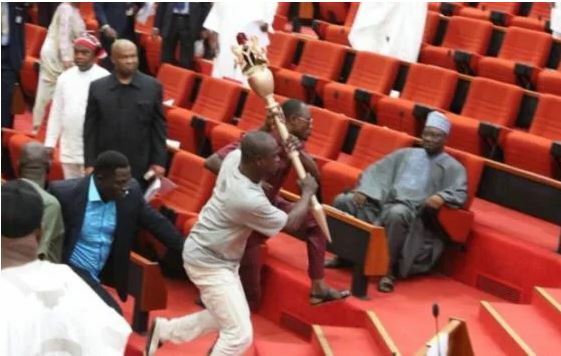 Security operatives at the National Assembly, Thursday, said they could not overpower the hoodlums who carted away the Senate mace because they lacked the requisite training and facilities. Speaking with a high ranking officer in the office of NASS sergeant-At-Arms, who did not want his name in print, he said, “our major challenge is that our staff need training, continuous training. It could be organised by outside experts or among ourselves on how to handle the situation in the chambers”. But when grilled on why the suspended Senator, Ovie Omo-Agege was even allowed into the Senate chamber, he said, “Actually, he was not supposed to have been allowed. But the way we work here, sometimes, we are being demoralised. Maybe, our staff were thinking that if they had stopped him, some of his colleagues would have intervened. “When the hoodlums were intercepted, the suspended senator said, ‘They are with me’. You know when your master said, they are with me, it becomes a normal thing since he has identified them”.